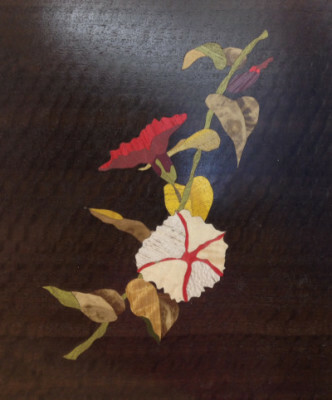 In marquetry, a scroll saw is used to cut veneers which are then assembled to form a picture or design and applied to a surface. It can be framed or incorporated into furniture. Guest instructor, Betsy Pepper, will teach you to utilize the grain, figure and color of various wood veneers to form images in wood. You will learn to layout, trace, cut, tape, glue and press your design. Repairing common mistakes will be covered and you can experiment with “sand shading”. You will need to purchase some tools and materials listed below. X-ACTO knife with several extra #11 blades. Several #2 pencils and erasers. You will also need at least one white pencil to mark on dark woods. Small kitchen sponge, a large plastic butter tub lid, and a gallon zip lock bag to store your wet sponge. Self healing cutting mat, 18″ x 24″ (available at hobby stores). A cloth baby diaper safety pin or a “t” top straight sewing pin. A pair of sharp craft scissors. Veneer, MDF and tracing paper will be provided by the school.